Ukrainian journalists and activists are trying to expose the Kremlin's latest propaganda effort: the perception of a pro-Russian movement similar to Maidan. A large animated crowd of pro-Russian demonstrators gathered outside the Kharkiv city council building in eastern Ukraine, watching and cheering as a young man in his mid-20’s, wearing a green military-style jacket, took down the Ukrainian flag at the top of the building and replaced it with a Russian flag. The startling action took place on March 1, 2014, just months after massive protests against President Victor Yanukovych’s decision to abandon an agreement on closer ties with the European Union — in favor of greater cooperation with Russia — had filled Independence Square in Kiev. Yet, when news about the citizen of Kharkiv raising the Russian flag over the city council building appeared on the Internet later that day, ordinary Ukrainians had many reasons to doubt the demonstration was real. After all, the Kremlin had been waging a hybrid war against Ukraine to discredit the wave of pro-Europe protests, known as Euromaidan, since they began in November 2013. A week later, StopFake.org, a website run by Ukrainian journalists aiming to refute distorted information about the events in Ukraine, discovered that Kharkiv’s pro-Russian demonstration was likely staged. 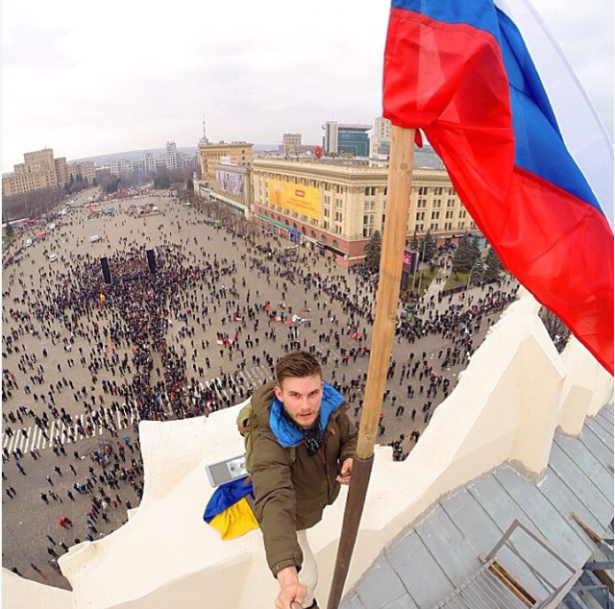 The Ukrainian activist holding the Russian flag on top of the city council building turned out to be a young Russian man from Saint Petersburg named Michael Ronkainen. StopFake reported that the Russian activist outed himself in a picture he posted to his Vkontakte page (a Russian analogue of Facebook). According to Tetiana Matychak, the editor-in-chief of StopFake, it was readers who brought the story to the journalists’ attention — specifically those from Eastern Ukraine, who were aware of Russia’s efforts at deception. “We were surprised, but we checked the information very carefully and concluded that our readers were right,” Matychak said. After the “Kharkiv activist” was exposed, more readers began sending tips to StopFake, including one about a Russian flag being raised in Donetsk at a pro-Russian rally, where participants seized the regional council building. StopFake, with help from its readers, soon discovered that the activist holding the flag, Rostislav Zhuravlev, came from the Russian city of Ekaterinburg and was a friend of the self-proclaimed governor of the Donetsk region. The stories of these two Russian activists are just a few of the fakes among a broader range of false information and propaganda about the situation in Ukraine produced mostly by the Russian mainstream media. For more than a year now, journalists and activists from StopFake have tried to debunk distorted information and identify made-up reports and commentary through careful verification and fact checking. When Matychak and her colleagues started StopFake, they only intended to run the website for two or three months, but the propaganda quickly increased and spread out of control, such that they could not let it go unanswered. According to Nataliya Gumenyuk, a Ukrainian journalist and co-founder of online news station Hromadske TV, pro-Russian activists have used a number of nonviolent tactics, including occupations and barricades, to create the perception that they are engaged in popular struggle similar to that of the protesters in Maidan, the central square in Kiev. Even though pro-Russian activists were occasionally able to make their protests appear peaceful and resemble the nonviolent atmosphere of Maidan, some of the most important aspects of nonviolent struggle were missing — namely spontaneity and authenticity, as Gumenyuk explained. In a 2014 webinar about the Maidan Revolution produced by the International Center on Nonviolent Conflict, Gumenyuk elaborated on several other ways pro-Russian activists have mirrored the actions of their Maidan counterparts. “There have been reports of protesters who came from the villages and stayed in the tent city in Luhansk — for publicity purposes — only to return home in the evening after the cameras were gone,” she said. Meanwhile, the barricades in Donetsk are “poorly constructed and serve no practical purpose, especially considering they are guarded by armed men.” This is in contrast to the ones at Maidan, which were created to stop the crackdown on protesters by police. Such actions led to the creation of what Gumenyuk referred to as “the ‘mirror image’ of Maidan, an attempt to give legitimacy to the pro-Russian resistance movement. Unlike the staged protests in Eastern Ukraine, however, Maidan was an authentic grassroots movement. According to Gumenyuk, people followed the genuine spirit of the protest present at Maidan, which the staged pro-Russian protests always lacked. According to Jamila Raqib, executive director of the Albert Einstein Institution, a Boston-based non-profit devoted to advancing the study of nonviolent action, “Governments and others have, historically, tried to undermine nonviolent movements by accusing them of being created and funded by foreign governments.” Kremlin-sponsored media outlets, in particular, have played a leading role in such efforts, routinely crediting Western powers with the string of popular uprisings that took place in the early 2000s in Serbia, Georgia and Ukraine. Some outlets have focused on Albert Einstein Institution founder Gene Sharp, often considered the leading theorist on nonviolent conflict. During the recent conflict in Ukraine, Putin relied heavily on the information warfare conducted in social and mainstream media. According to Barkowski, his objective was to “deceive adversaries, blur the line between reality and fantasy, drive a wedge between Western allies, and keep the Russian population itself in the dark.” To that end, Putin’s strategy has been extremely effective. Russia’s information warfare has deceived large audiences. At the beginning of last fall, Putin’s approval rating was at 88 percent. Thereafter, the financial crisis notwithstanding, 70 percent of the Russian citizens expressed support for Putin’s policies in Ukraine. Raqib also thinks the protests organized by pro-Russian activists in Eastern Ukraine were effective and — perhaps more alarmingly — can be seen as part of a larger global trend. “Governments are studying this,” she explained. “They recognize that they need to use some elements of nonviolent struggle against nonviolent movements.” This is something Raqib feels the nonviolence community needs to better understand, if it’s going to find effective ways of counteracting a growing trend toward hybrid warfare. A native of Saint Petersburg, Russia, Anastasia is a peace journalist and media researcher currently living in Washington, D.C. She works on security, human rights, and civil liberties issues at ReThink Media and serves as a Youth Advisory Board member at London-based Index on Censorship. She is on Twitter @Anastasia140491.